Whew....those shiny new cams make me feel all funny inside! Yep, I am a fan, sir. Hahahaha! Me too Brother! I had to take one last photo of how pretty the cams are before I put the assembly lube on the lobes! 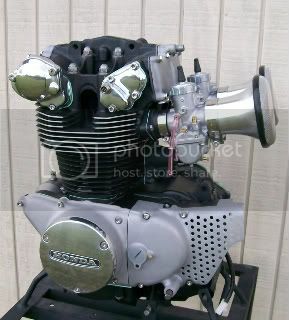 Here is a photo of the engine with the Mikuni VM32 carburetors and stacks! Joe, sent you a PM. I am a lucky man! Joey, you the man! I could never thank you all enough for your compliments and support or put into words how much they truly mean to me, you all make me very proud to be a member here. Thank you Brothers! 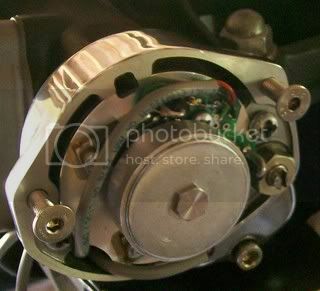 Here is a photo of the electronic ignition that Brother Habanero52 decided to use installed in the engine. I am putting the finishing touches on the engine now so I will add all of the before and after photos very soon! any tips for tools to use on polishing those covers? I have a dremel but i think i need better attachments. What did you use? Fantastic! Did you do any porting or anything to that beast?